You'll be £19.99 closer to your next £10.00 credit when you purchase Crossing the Rapido. What's this? The Rapido River was the last natural barrier between General Mark W. Clark’s Fifth U.S. Army and Rome. Always aware of publicity, Clark wanted desperately to liberate the Eternal City from the Germans before anyone else did—British or American. Ignoring intelligence reports that the Germans had significant forces protecting the opposite side of the river, Clark ordered the 36th Texas National Guard Division to make a nighttime crossing on January 20, 1944.
borne away or vanished in massive explosions. The few who managed to cross found themselves pinned down on a muddy bank raked by gunfire. Soldiers died by the hundreds, yet the stunned survivors who fell back to the launch site were ordered to attack again, this time in daylight. Of the 4,000 men who attempted the crossing, more than half did not return. And to this day the survivors have not forgotten the Rapido or the general who sent them there. Clark’s forces did eventually capture Rome on June 4 1944, but the ghosts of Rapido haunted Clark. He had insisted on blaming subordinates for the disaster, including the 36th Division’s commanding officer, rather than admitting his plan was flawed. Congress would ultimately investigate Clark’s decisions, and his quest for a fifth general’s star remained unfulfilled. 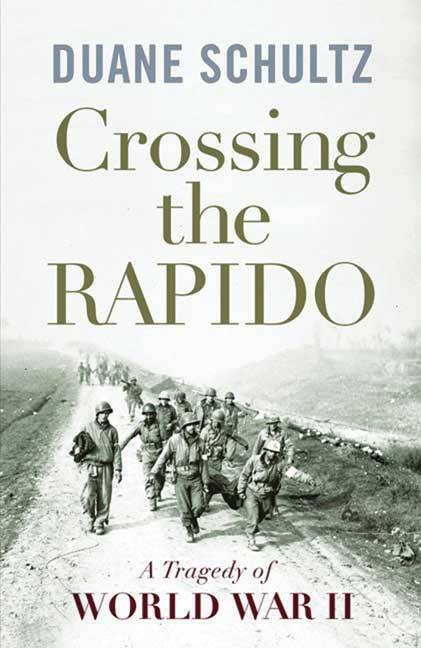 In Crossing the Rapido: A Tragedy of World War II, the first book-length history of this important battle and based on survivors’ interviews and army documents, Duane Schultz demonstrates that the American soldier will face the greatest odds without protest, but expects those in command to share any failure or success.